Life has been so good, and busy, lately and there just hasn’t been time to blog. So a quick recap. We have moved into our house. We love our house. Our clothes are not in boxes, but in dressers. Our books are on shelves. Our dishes are in cabinets. Our pantry still needs to be put in order… but everything else is good! I left work early on December 23, and we took off to Virginia Beach. After a 3 hour frantic search in the greater area of Virginia Beach for a specific toy, on behalf of Josh’s uncle, we got to the Sims house. True story: I almost punched a grown man, with a beard, employed by Toys R Us who informed us that they did have the specific toy we were looking for… but HE PURCHASED THE LAST ONE. This entire experience was new for me. I’ve been one to have my Christmas shopping done in advance, and have never been out at the last second looking for ONE specific thing. I feel like Josh and I have learned a valuable lesson… keep doing things ahead of time. Hehe. No, we didn’t find the toy… but I feel like the toy that ended up being purchased was even cooler. And yes, I referred to the Arnold Schwarzenegger movie about a million times during our search. Christmas Eve, I experienced my first Sims Christmas ever. It was SO fun. 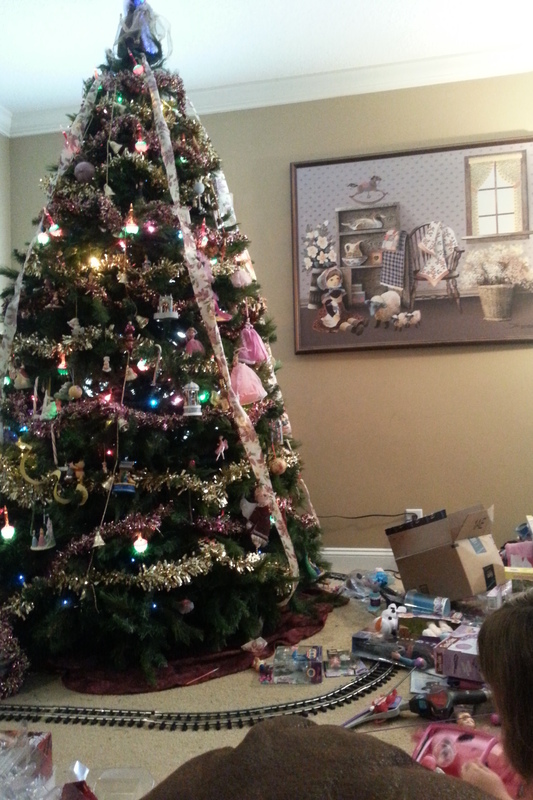 Huge breakfast, lots of presents, lots of laughter. Christmas was so exciting. My family doesn’t have the excitement over toys, and bubbling about what Santa (or Tinsel) brought them. Josh’s family does. Going into Christmas this year was difficult because I have been feeling the stress of work, rather than the magic of the holiday… and the excitement of the little girls was not overwhelming, but refreshing. (Except for the fact that they woke us up before 6:30 on Christmas… that was exhausting.) I got things that I wanted, and things that I needed… a crock pot, a book of sewing patterns, a rain coat, sweater, jewelry, pictures, etc… honestly, what meant the most is realizing-again- that they really are my family. I’m so thankful for the way they have all loved and accepted me. This was probably the weirdest, but most wonderful part: it was strange not being with my family, but I didn’t miss it too much… because I felt like I WAS with family. Well, basically I wanted to burst into tears because it meant so much to me. I’m so very thankful for such wonderful sisters. 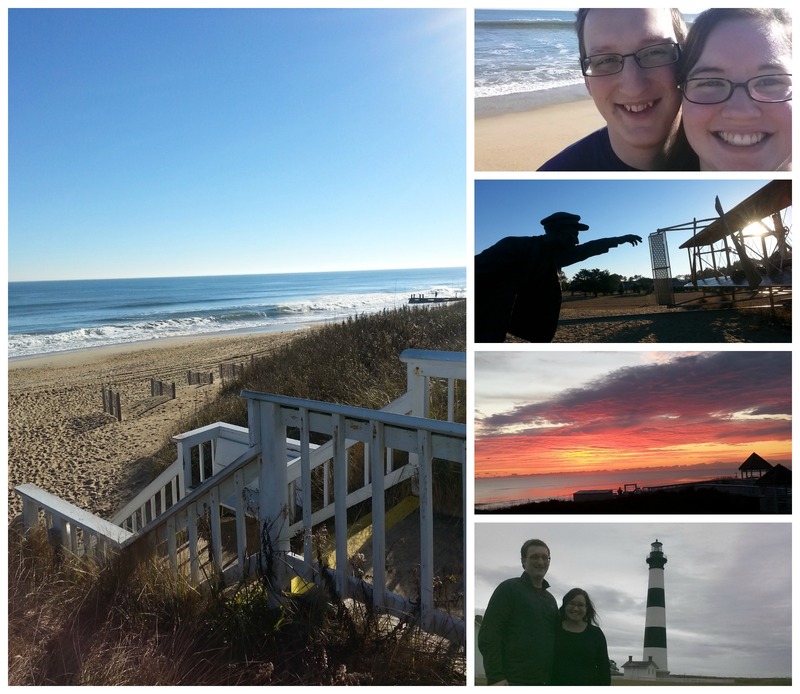 The day after Christmas, Josh and I headed to the Outer banks for our Anniversary trip. We checked into our hotel, got pizza, and enjoyed doing nothing. The trip was perfect… just perfect. We slept in, laid around because we could, walked on the beach, had a poor breakfast experience-which we will not go into because it was very frustrating but the food was free, went to the Wright Brothers memorial, went to see Into the Woods (and got crazy— we got popcorn), went out for Mexican and reflected on the year, watched the sun rise, walked on the beach, had a wonderful breakfast on the 2nd day, went to a lighthouse, went to the aquarium, and I had the first big mac of my life (I am a little irritated that they taste so good). Josh wrote out questions on index cards that we went through all weekend… “Favorite meal of this year? Favorite inside joke? Something you’d like me to work on?” etc. It was such a good time to escape together, reflect on the first year, make goals and plans for the second, and to enjoy being together. No, we didn’t save the top layer of our wedding cake. But I’m glad… because eating old, stale cake doesn’t sound like much of a celebration of a momentous year of trusting God together, becoming unified in a budget, and of making two lives one. This year has been anything but stale… so we baked a fresh cake and ate that in celebration instead. Beach. Wright Brothers Memorial. Sunrise. Bodie Lighthouse. Since vacation, life at work has been very busy- hence the lack of blogging. My family came to visit last weekend– they actually surprised me with an early birthday party! We had too much fun with them- shopping, exploring a museum, walking, cooking, laughing, playing games… I’m always so happy to have them here, and always cry my eyes out when they leave. Part of my Christmas/Birthday money was spent on a Fitbit, which tracks all sorts of nifty stuff, including my steps. It may seem like a typical New Years resolution, but my decision actually doesn’t have to do with that at all… I’m finally healthy, after Mono. I have some energy, and I want to get back into exercising regularly. So far- the Fitbit has been extremely helpful in motivating me, and I’m excited as Josh and I are taking this on together (plus I am finally realizing I am extremely competitive…. so that helps since Josh and I compare how many steps we’ve gotten). I am so glad I finally got to participate in the legendary Corneli-Sims Christmas. Although it was new, it was wonderful and I’m so very thankful for your family. It’s the second year of marriage, and it’s only more fun. Thanks for loving me so well, and for keeping laughter as a staple in our relationship.